Home / Humble student of the markets / A correction, or the start of a bear market? A correction, or the start of a bear market? Subscribers receive real-time alerts of model changes, and a hypothetical trading record of the those email alerts are updated weekly here. The hypothetical trading record of the trading model of the real-time alerts that began in March 2016 is shown below. 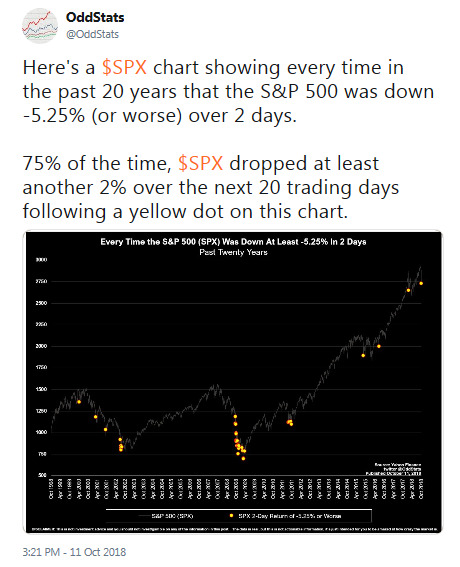 When the market selloff began last Wednesday, Callum Thomas conducted an (unscientific) Twitter poll asking if this is a correction, the start of a bear market, or just market noise. The overwhelming response favored a correction, which is contrarian bearish from a sentiment viewpoint. 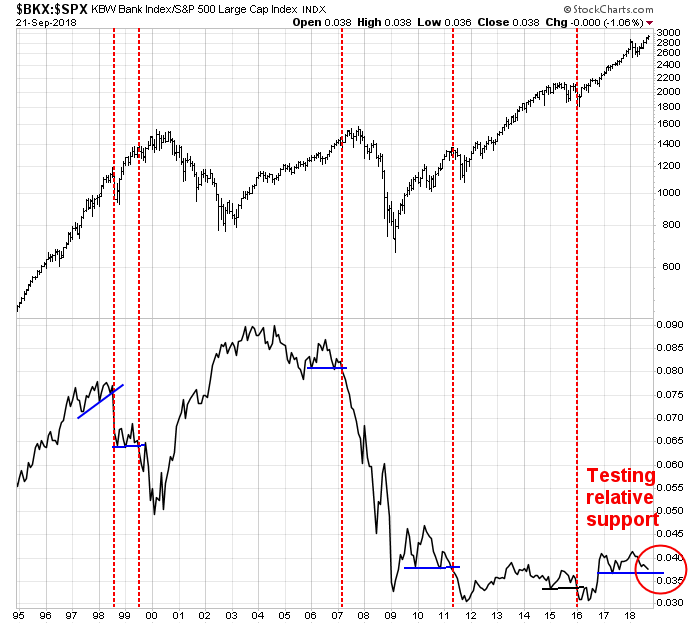 There are numerous reasons to support the case that the latest round of weakness is only a correction. First, there are no signs of a recession yet. As I pointed out last week (see A recession in 2020? ), my recession indicators are not flashing red, only flickering. We do not have a definitive recession signal yet. As investors know, recessions are bull market killers. Another support for the bull case is analysis from Bryce Coward of Knowledge Leaders Capital that the bond market selloff, which sparked the rout in equity prices, may be mostly over because the bond market has mostly discounted the Fed’s expectations as outlined by the “dot plot”. Coward found that the spike in bond yields was mainly attributable to rising term premium, with little movement in inflation or real growth expectations. When trying to understand the recent move in bonds, it’s helpful to measure the movement of each component of the bond: real growth expectations, break even inflation, and the term premium. The 18 basis point move was driven by the term premium rising by +18bps, a +1bps point rise in inflation expectations and a -1 basis point decrease in real growth expectations. That is, there was practically no alteration of either inflation expectations or growth expectations, and nearly the entire sell off was driven by the term premium. But just how much more does the 10-year need to rise to reflect Fed policy expectations? Very short-term rates could rise a little further, but longer-term rates are about reflecting the terminal Fed funds rate for this cycle. That is, the market could fully discount the Fed’s dot plot via curve flattening. As previously stated, the 10 year treasury bond yield is just the sum of the expected future short-term rates. At the end of the rate hiking cycle, those expectations should configure themselves such that the 10 year bond equals the terminal Fed funds rate. The median Fed member’s terminal Fed funds rate is currently 3.375%, just 17bps higher than the current 10 year treasury yield. The weighted average Fed member’s terminal Fed funds rate is 3.28%, just a few basis points higher than the current rate. This tells is that the rise in yields may be closer to its end than its start, but there is still a little to go to completely discount Fed policy, especially on the short end of the curve. The 10 year rate is very near to the Fed funds terminal rate for this cycle. This implies that long rates may not need to move much more to fully discount Fed policy, but that shorter-term rates may need to move a bit higher still, flattening the curve a bit. Finally, one reason that is suggestive of a shallower, rather than deeper pullback, is a bifurcation in sentiment. 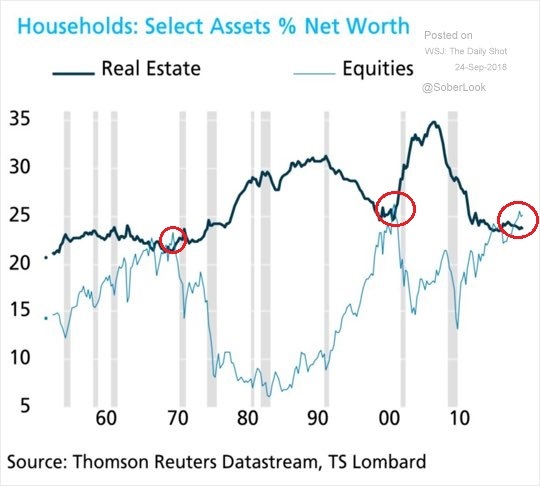 I have outlined how long-term individual investor sentiment is over-stretched by historical standards, such as how household equity assets have exceeded real estate holdings (see The things you don’t see at market bottoms: Booming confidence edition). 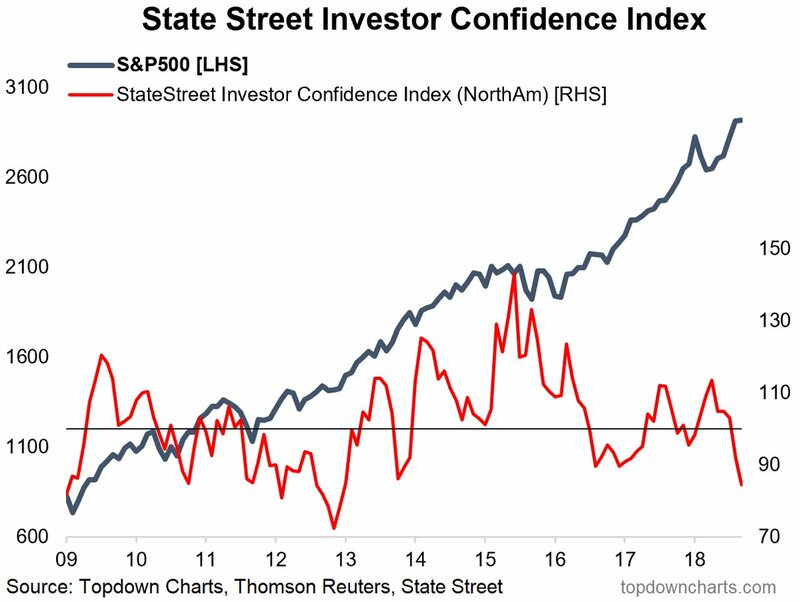 By contrast, various institutional surveys have shown that institutions are generally cautious on equities, which would put a cushion on stock prices if they decline. 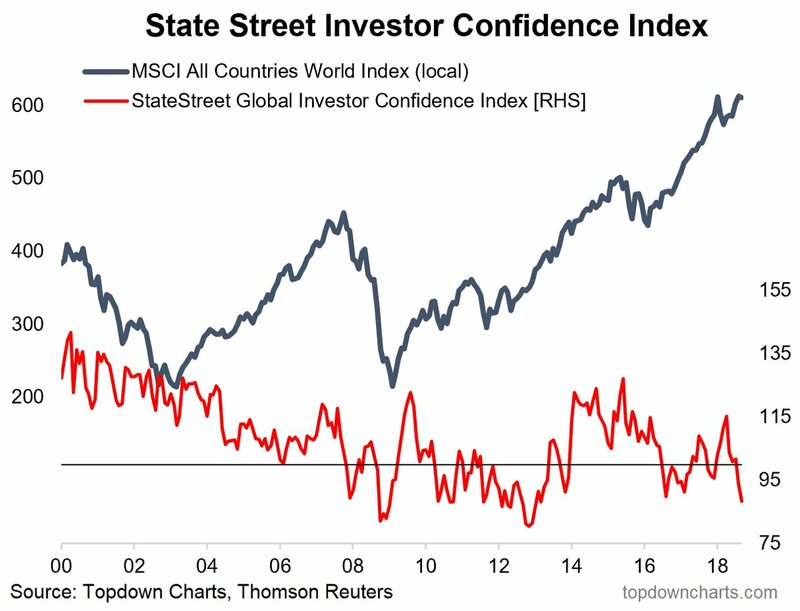 Callum Thomas highlighted data from State Street’s custodian data, which shows that US investors are already defensively positioned. 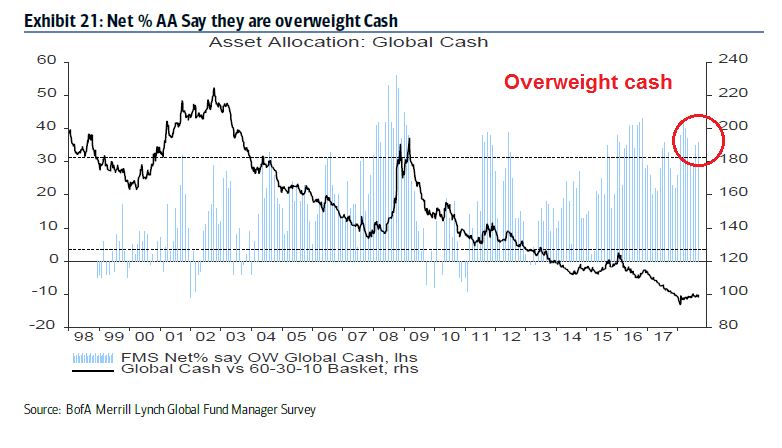 Global institutional investors are also cautious on equities. 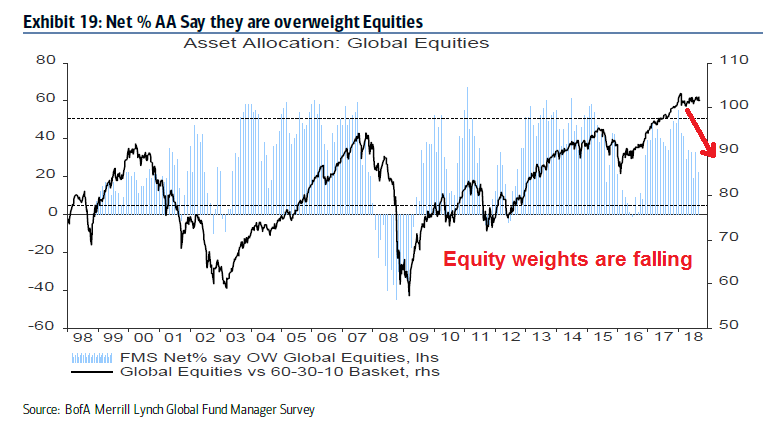 …and they have been reducing their equity weights since late 2017. While individual investors may be all-in on equities, institutions are cautious, which would provide a cushion should stock prices decline significantly. While the case for a correction rests mostly on conditional outcomes, such as the lack of a recession signal right now, there is no assurance that the economy will not fall into recession in late 2019 or early 2020. The Powell Fed has made it clear that the default path for monetary policy is to keep raising rates until they see definitive signs of a slowdown, otherwise known as “when something breaks”. 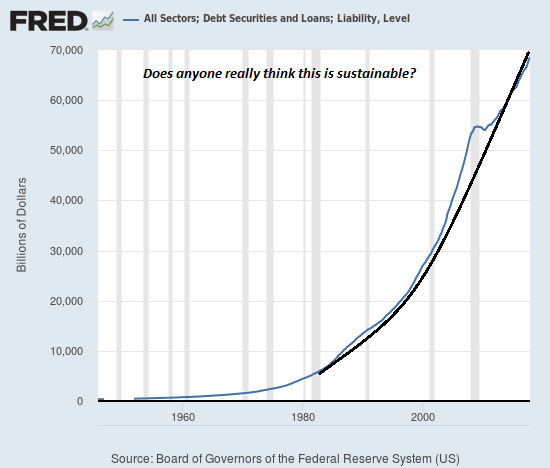 While Powell has stated before that he is putting less weight in economic models, such as the Phillips Curve, and greater weight in market-based signals as measures of financial stability in monetary decisions, don’t expect a Powell Put in the manner of past Greenspan, Bernanke, or Yellen Puts. Bloomberg reported that New York Fed president actually welcomed the stock market selloff as a way of cooling off risk appetite. In short, despite the tamer than expected CPI print last week, don’t expect the Fed to pause in its policy path any time soon. The Fed is well on its way to keep raising rates until it sees signs of a cooling economy, by which time it may be too late to reverse course and avoid a recession. As well, the counterpoint to the above analysis from Knowledge Capital Leaders indicating that the 10-year Treasury yield has mostly discounted the rate path implied by the dot plot is further rate hikes will act to invert the yield curve. Bloomberg also reported that Street strategists also expects the yield curve to continue flattening into 2019. Past inversions have been sure fire recession signals. Even if the economy were to sidestep a recession, Trump’s trade policies have introduced further downside risk in the form of slower global growth. Notwithstanding the looming trade war between the US and China which could slow the two economies, as well as the economies of their major trading partners, the trade war is turning into a new Cold War. This is a new development that represents a tectonic shift in global trade patterns that puts a long-term speed limit on global growth potential. The recent bombshell report from Bloomberg that Apple and Amazon’s network servers may have been compromised by Chinese spy microchips embedded in the motherboard of servers is a case in point. Despite the vehement and specific denials by Apple and Amazon, which were made by technical personnel rather than lawyers; the Reuters report that the UK cyber security agency supports Apple’s position, and whose denial was confirmed by the US Department of Homeland Security, these revelations will have a chilling effect on the ability of the Chinese to sell electronics to foreigners. The SCMP reported that this incident will force US vendors to re-think their supply chain security. Although experts remain divided over whether China has the technical know-how to pull off the spy chip hack described by a Bloomberg BusinessWeek report last week, technology research firm IDC believes one thing is certain – the incident will push US hardware vendors to reconsider the integrity and location of supply chains to safeguard security. “Advanced semiconductor design is the next battleground between China and the rest of the world to ensure security is hard-wired in silicon to employ the most stringent standards and processes across the supply chain,” according to an IDC report co-authored by five analysts including Mario Morales, programme vice-president of enabling tech and semiconductors. “Vendors will also continue to move forward with implementing their own hardware design and extend the capability to critical components needed for their equipment and workloads. This will be the new arms race in the IT world,” the report said. IDC said that the ramifications of the story are just beginning to be felt, and cautioned that China’s manufacturing and supply chain is deeply integrated within the business models of many US companies. As such, the supply chain dependency of many American-based vendors will need to be reassessed to stave off any future security hacks. The administration’s clearest and most comprehensive broadside on China yet followed what one official called “thousands of hours” of study and planning. It will involve agencies across the U.S. government, from the Pentagon to the U.S. Trade Representative. The consequences will be both immediate and potentially generational for global economic and security matters. A landmark speech by Vice President Mike Pence at the Hudson Institute, calling out China as America’s foremost threat, ahead of Russia, due to both the scope and seriousness of its activities abroad and within the United States. An underreported aspect of the new U.S.-Mexico-Canada trade agreement that requires all three parties to inform the others if they begin trade talks with “non-market economies” (read China). Trump administration officials view it as a template for trade deals to follow. A leaked report that the U.S. Navy’s Pacific Fleet has proposed a series of military operations during a single week in November to send a warning to China and to provide a deterrent to its Beijing’s regional military ambitions. On Friday, the Pentagon released the results of a yearlong look at vulnerabilities in America’s manufacturing and military industrial base. “China represents a significant and growing risk to the supply of materials deemed strategic and critical to U.S. national security,” including a “widely used and specialized metals, alloys and other materials, including rare earths and permanent magnets,” the report says. The five nations in the world’s leading intelligence-sharing network have been exchanging classified information on China’s foreign activities with other like-minded countries since the start of the year, seven officials in four capitals said. The increased cooperation by the Five Eyes alliance – grouping Australia, Britain, Canada, New Zealand and the United States – with countries such as Germany and Japan is a sign of a broadening international front against Chinese influence operations and investments. Some of the officials, who spoke on condition of anonymity because of the sensitivity of the talks, said the enhanced cooperation amounted to an informal expansion of the Five Eyes group on the specific issue of foreign interference. While China has been the main focus, discussions have also touched on Russia, several said. As China has been a major engine of global growth over the last few decades, these steps are likely to have the secular effect of slowing overall global growth potential. Already, China is seeing the cyclical effects of slowing growth. Chinese business confidence is getting crushed in the wake of the trade war. The Thomson Reuters/INSEAD Asian Business Sentiment Index for China has plunged from 63 to 25. 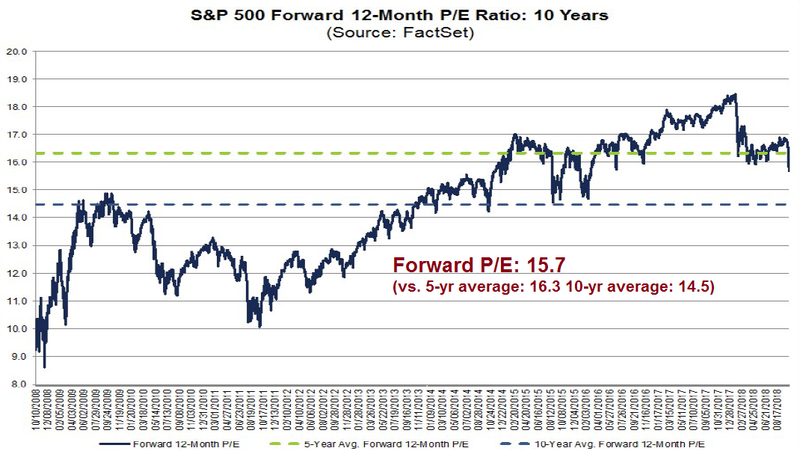 The last major risk to the bull case comes from overly optimistic earnings expectations. 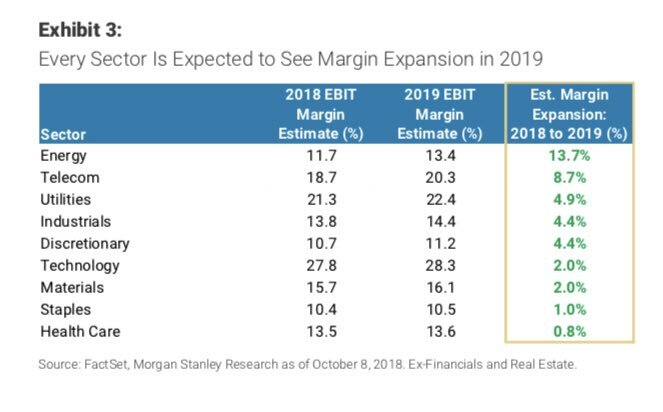 Analysis from Morgan Stanley shows that the Street expects margin expansion in every non-financial sector in 2019. Either margin pressures from rising tariffs, or inflationary pressures if higher tariffs are passed through to consumers. In the latter case, the Fed will be forced to raise rates at an even a faster pace. I will be closely monitoring Q3 earnings season for clues on these two key issues. How much pressure are they seeing from higher compensation costs? What about the trade war? The initial effects are just starting to be felt, and we may see either cost pressures, or guidance as to the ability of companies to pass on tariff related price increases. 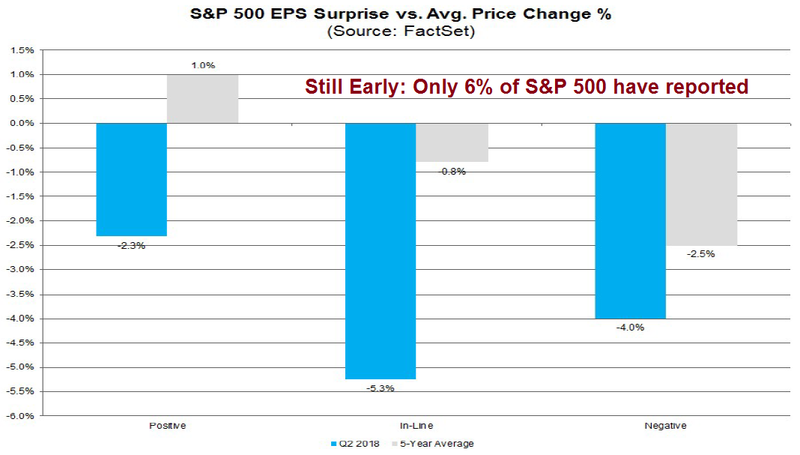 As time passes, these dual pressures are likely to increase and so does the risk for earnings disappointment. To recap. Is this the corrective pause that refreshes, or the start of a bear market? Frankly, I don’t know. However, I am relying on the following disparate real-time macro and technical tripwires for a bear market. First, the relative performance of bank stocks has been a good real-time warning of rising stress in the financial system. These stocks have been weak on a relative basis and they are on the verge of testing a key support level. Watch for a technical breakdown, which hasn’t happened yet. 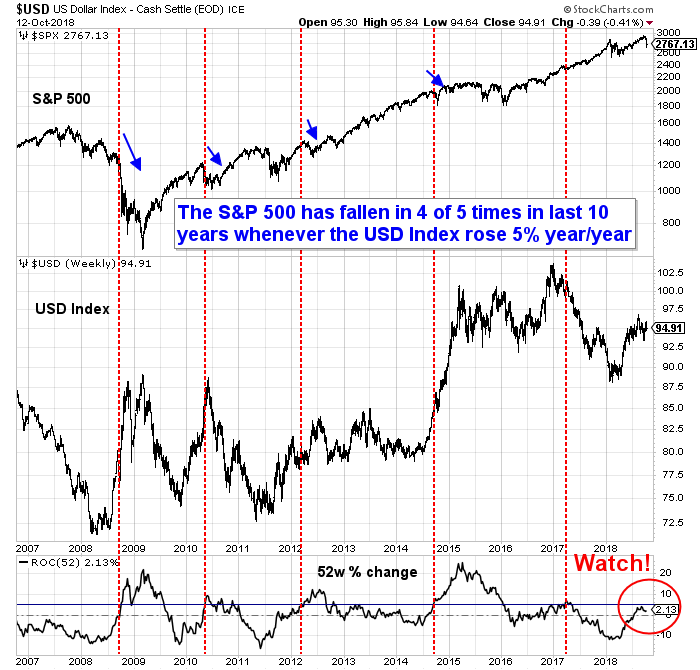 The stock market has stumbled four out of five times in the last 10 years whenever the USD Index has risen 5% or more year/year. That’s because the USD has both been viewed as a safe haven currency, a rising USD also acts as a form of monetary tightening, and a stronger greenback creates an earnings headwind for large cap multi-nationals with foreign operations. The USD Index would need to reach about 98 to trigger this bearish tripwire. Rising oil prices have historically been a sign of rising inflationary pressures, which would force the Fed to take a proactive stance to cool growth excesses. 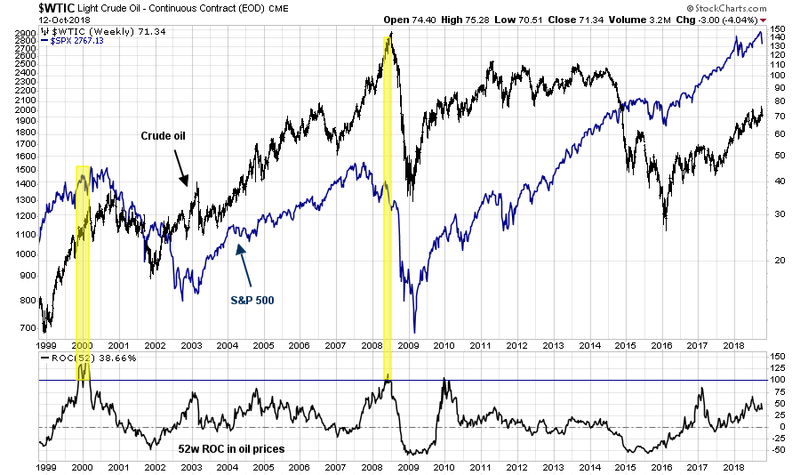 In the past, stock prices have take a tumble whenever the year/year change in oil prices exceed 100%. Oil prices would have to reach about $100 to trip this bearish indicator. 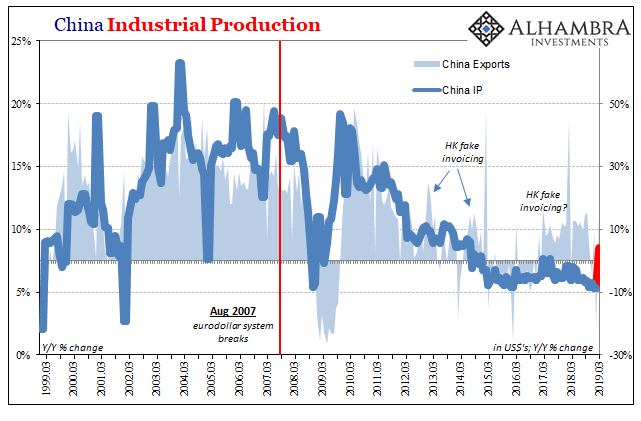 As well, it is becoming clear that China and Asia are undergoing a major slowdown. The key question is the resiliency of the Chinese economy and financial system. The canaries in the coalmine are the Chinese property developers, such as China Evergrande (3333.HK). So far the stock has retreated and it is testing a major support level. A decisive break could be a real-time signal of an uncontrolled unwind of leverage whose effects could spread worldwide. Watch closely! Finally, I warned in the past about the technical risks posed by the negative monthly RSI divergences showing up in the Wilshire 5000 chart. That said, past bearish breaks have been accompanied by a MACD sell signal, which hasn’t occurred yet. The reading is barely positive, and we would need to see a negative monthly close before flashing a sell signal. That said, MACD did flash a sell signal for global stocks in July, and global stock prices have historically been higher correlated with US stock prices. The good news that is none of these bearish tripwires have been triggered. 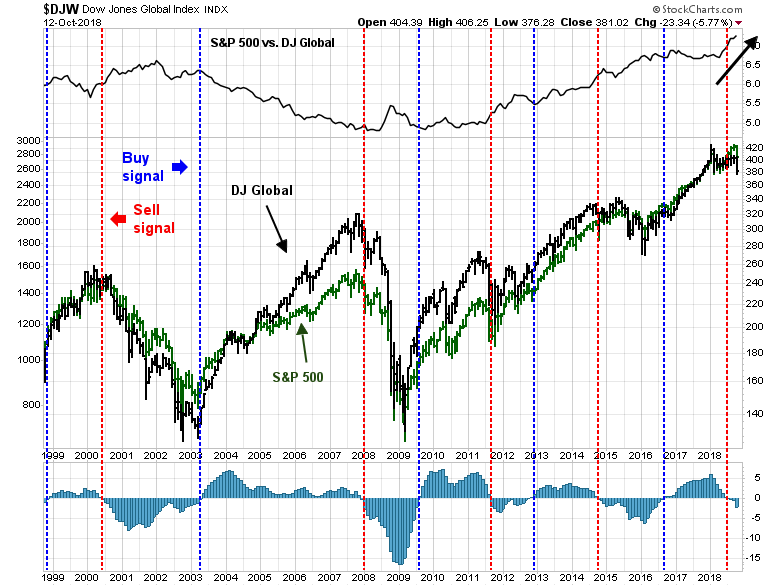 However, it doesn’t mean that the bulls can sound the all-clear signal. A number of these indicators are on the verge of turning bearish. I am watching these indicators closely. Each of these indicators represent an independent dimension of market risk, and any of the them, it’s going to mean trouble. Nevertheless, I am maintaining an open mind as to how these risks resolve themselves. Looking to the week ahead, the market has suffered much technical damage in a very short amount of time. 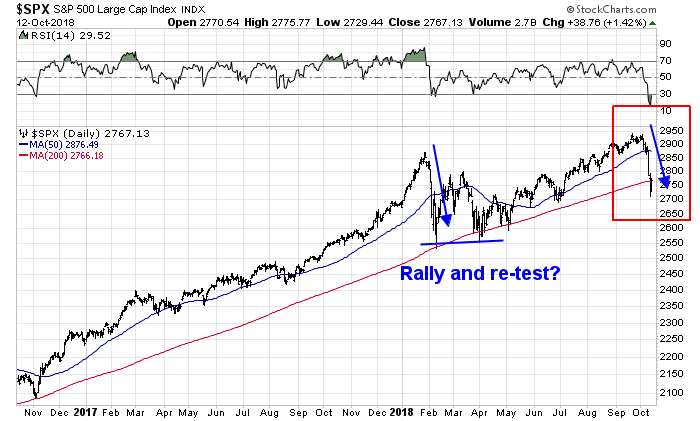 It is highly unusual for stock prices to suddenly fall from an all-time, slice through the 50 day moving average (dma) support, and then cratered to the 200 dma, all in less than two weeks. It is difficult to believe how the bulls could regain control and proceed as if nothing happened with a V-shaped recovery. The last time this happened was the February correction after the January blow-off. The market rallied, but returned to test its lows about two months later. The SPX ended the week at 2767, which is about the level of its 200 dma. However, it is difficult to know what the downside potential is should the 200 dma fail to hold as a support level. The next support level may be the lower weekly BB, which stands at roughly 2700. Callum Thomas’ Twitter poll shown at the top of this post where 52% of respondents believed (as of Thursday morning) that this bout of market weakness is just a correction is worrisome. It suggests a strong entrenchment of the “pause that refreshes” or “this is a opportunity to buy the dip” mentality. Even if this is just a correction, the market may need a further shakeout to shake that complacency before a durable bottom can be seen. 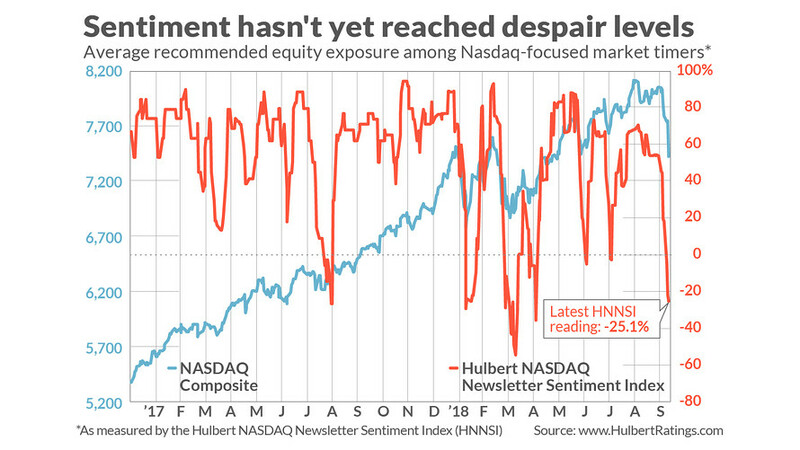 Mark Hulbert pointed out last Thursday that his Hulbert Nasdaq Newsletter Sentiment Index (HNNSI), which measures the sentiment of Nasdaq market timers, had not fallen to washout levels yet. These readings also suggest that the market may need another downleg or re-test of the previous lows before a durable bottom is made. 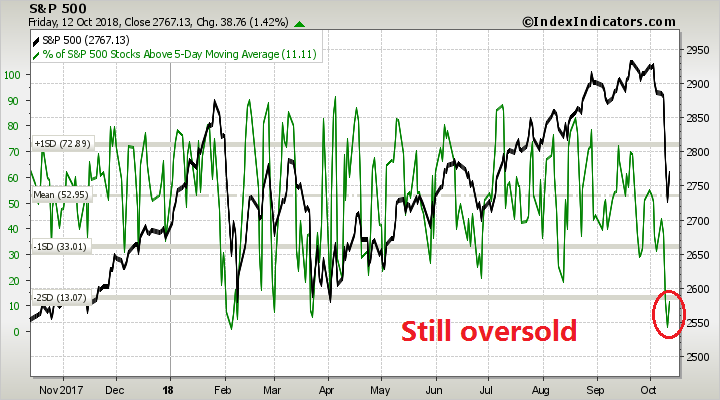 However, it is also becoming apparent that the stock market is poised for an oversold bounce. Subscribers received an email alert after Thursday`s close indicating that the short-term trading model had turned bullish. Breadth indicators were oversold across multiple time frames. That said, past instances of these oversold extremes resolved themselves with an initial rally, followed by a retest of the lows some days and weeks later. 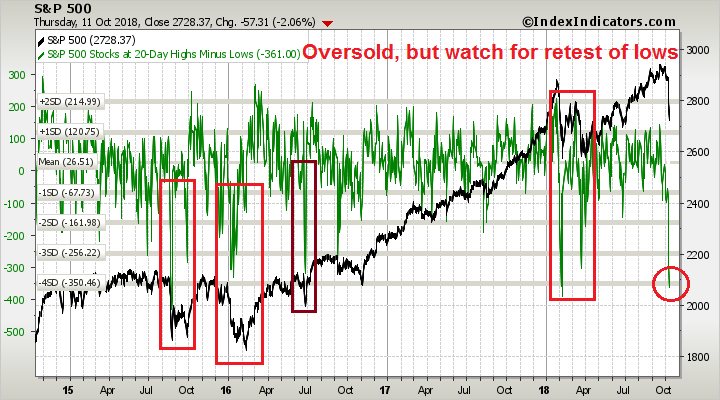 Indeed, the short-term breadth indicator (1-2 day horizon) has already begun to normalize, but the market remains oversold. The only question is how far this reflex rally can run. Rob Hanna at Quantiable Edges offered some clues through his historical studies. He searched for back-to-back 50-day lows accompanied by extremely oversold RSI readings. This signal was triggered as of last Thursday`s close, and he found that the market tends to top out again between 3-5 days after the event, which makes the top either this coming Tuesday or Thursday. Next week is also option expiry (OpEx) week, and Hanna found in a separate study that October OpEx has a historical tendency to be extremely bullish. He found that the market has historically topped out on the Thursday during October OpEx week. If history is any guide, expect the trading peak to occur this coming Thursday. Even if you are bearish, wait for the bounce to short. 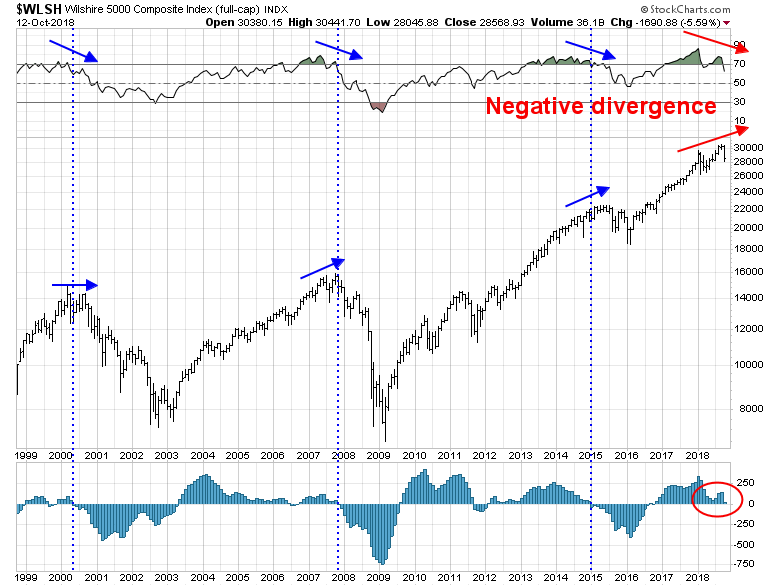 Markets simply do not melt down further from such extreme oversold levels. For now, my working hypothesis is a bounce of unknown magnitude and unknown duration, followed by a re-test of the lows (via OddStats). Severely oversold markets just don’t recovery and go straight up. However, the bulls have one ray of hope. The NAAIM Exposure Index, which measures the exposure of RIAs, fell dramatically last week to levels below its Bollinger Band (BB). Historically, a breach of NAAIM Exposure below its lower BB has been an excellent short-term buy signal (vertical lines). My inner investor become progressively more defensive since my warnings in August. He is monitoring the tone of reports from Q3 earnings season, which begins in earnest next week. The early results are mixed . 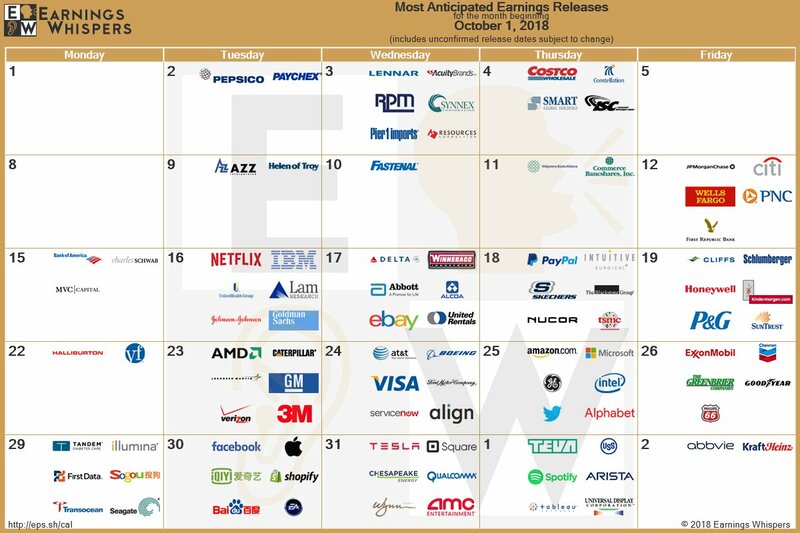 We are entering Q3 earnings season with heightened expectations and subpar corporate guidance. So far, companies with earnings beats are barely outperforming, but earnings misses are not being severely punished. As only 6% of the index has reported, these results are highly preliminary. We need to wait for more reports to gain a better perspective. There were, however, some macro insights from the limited number (N=24) of earnings calls so far. While companies cited the strong USD as the greatest headwind to earnings results, there are signs that rising wages are beginning to pressure margins. 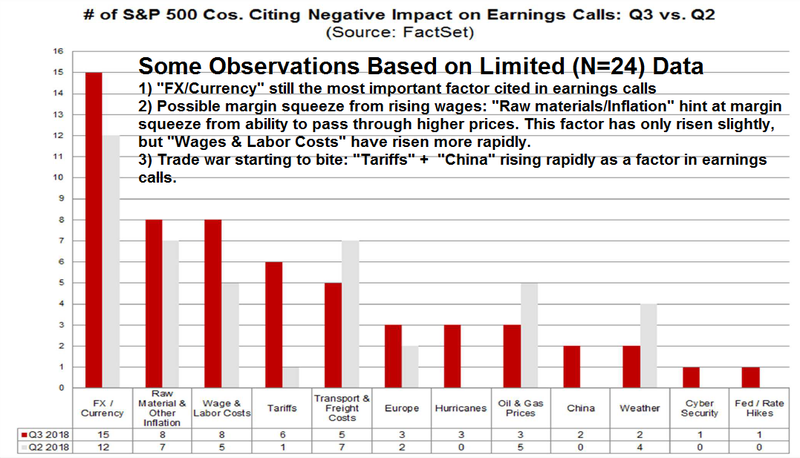 As well, the trade war is starting to bite as “tariffs” and “China” are increasingly being cited as the negative operating factors. Atlanta Fed president Raphael Bostic recently raised highlighted concerns about margin pressures from wages and tariff-related costs as a result of the Fed’s discussion with local businesses: These are factors that I will be monitoring as Q3 earnings season progresses. Consistent with aggregate measures of wage growth, reports from my district suggest some firming in labor costs. A growing number of firms across the District reported an uptick in merit increases, averaging in the 3 to 3.5 percent range. Further, there was a marked uptick in the reported ability of firms to pass on cost increases. This was especially true for firms subject to tariff- and freight-related cost increases. Those firms reported little to no pushback when passing along rising costs to their customers. But I get the sense that the phenomenon is becoming more widespread. It’s a development that I will continue to watch closely. 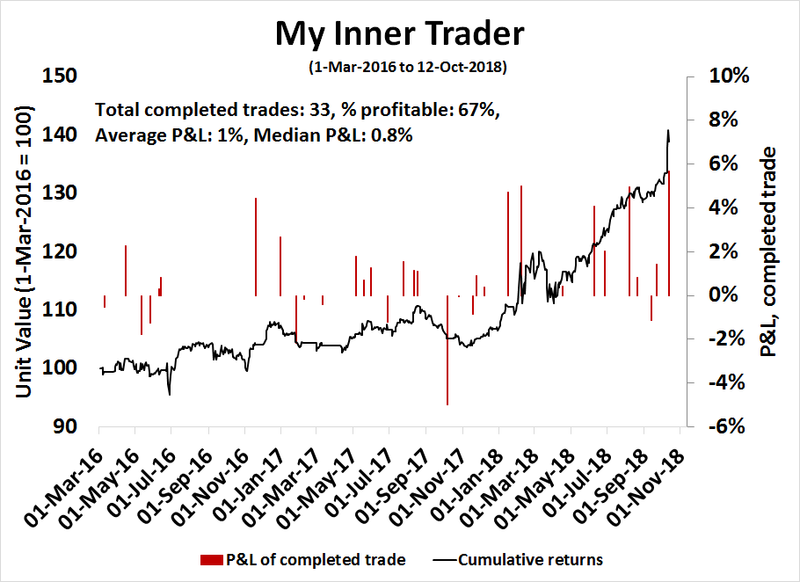 My inner trader took profits in his short positions and reversed to the long side last Friday in anticipation of a relief rally. Volatility has returned to the markets, and I would advise trader to scale their positions accordingly based their risk tolerance levels.